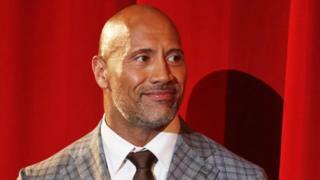 Dwayne Johnson has thanked fans for their support after he opened up about his battle with depression. The 45-year-old discussed his mother's suicide attempt and a period he described as the "worst time" of his life in an interview with The Express. "Got tonnes of responses to this. Thank you," he wrote on Twitter on Monday. "We all go through the sludge and depression never discriminates. "Took me a long time to realise it but the key is to not be afraid to open up. "Especially us dudes have a tendency to keep it in. You're not alone." The actor has previously alluded to his battle with mental health. When a fan recently told him he was suffering depression, Johnson wrote back: "I hear you. I've battled that beast more than once." In the new interview, which was published over the weekend, Johnson said: "I reached a point where I didn't want to do a thing or go anywhere. I was crying constantly." The actor also discussed the time, when he was aged 15, his mother tried to kill herself in front of him. "She got out of the car on Interstate 65 in Nashville and walked into oncoming traffic," he recalled. "Big rigs and cars were swerving out of the way. I grabbed her and pulled her back on the gravel shoulder of the road." He added: "What's crazy about that suicide attempt is that to this day, she has no recollection of it whatsoever. Probably best she doesn't." The actor said one of the lowest periods of his life came in 1995, after he was let go from the Canadian Football League and his then-girlfriend broke up with him. "That was my absolute worst time," he said. Johnson went on to become a successful wrestler, known as The Rock, before turning to acting in the 2000s, but he said he could have become suicidal like his mother while he was going through his darkest period. Johnson is now one of the world's best-paid actors, having starred in Jumanji: Welcome to the Jungle, Baywatch, Hercules, Central Intelligence, San Andreas and multiple Fast & Furious films.